The Square is enormous. Everybody tells you that, and they are all correct. Everybody also says that it’s too big to photograph, and they are right too. It is bounded on one long side by the red outer wall of the Kremlin, and on the other by the enormous and expensive GUM shopping mall. Not even one whole side of Red Square! I’ve used Cheryl Woodhouse’s picture of GUM, because I couldn’t take one. In the Soviet era, GUM carried the same products at the same prices as any other store in the USSR, but because of its proximity to the Kremlin, it tended to actually have items in stock, so enormous queues used to build up outside. During Perestroika, the GUM morphed into a collection of expensive boutiques and jewellery shops, and now no Muscovite shops there, because it is cheaper for them to fly to Italy to buy those same products. Indeed, every shop that we passed, with its expensive wares and guarded by impeccably dressed and very bored staff, was completely empty of customers. 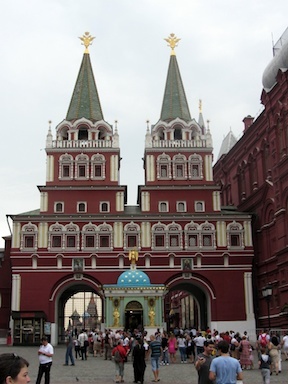 At one of the short ends of the square is the Resurrection Gate, rebuilt like much else in this area after it was torn down by the Soviet regime so that tanks could roll unobstructed into Red Square for parades. At the other end is of course St Basil’s, which is exactly as beautiful as you hoped it will be, and which somehow managed to survive the communist era because it was used as an armoury. The cathedrals of Red Square are really incredible confections. On the left is the Nikolas Tower. On our visit, the central part of the square was fenced off while workers removed a temporary ice rink and put in stands for an upcoming display of military marching. We made our way down the fourth long side, past the long queue of people waiting to file past Lenin’s tomb, to see the changing of the guard for the Tomb of the Unknown Soldier. This quite lovely sculpture outside the Kremlin is usually hidden by fountains, but luckily they were cleaning it. We’d been told that obtaining tickets to The Kremlin was a complicated process, and indeed it was. Initially we queued at the entrance, and when we reached the front, we were told that we should have pre-bought tickets in the Alexander Gardens below. We left and found a little row of ticket cabins. Each one displays a poster showing different “technical break” times of half an hour, twice a day, at which time that cabin will suddenly close and leave the queue hanging until they open again. The game is to judge which of the cabin queues will allow you to get to the front before that queue has a technical break. An additional complication is that tickets for the Armoury only come on sale at certain times, and go off sale when that ‘sceance’ is full. If you happen to reach the cashier after the end of one ‘sceance’ and before the start of another, then you are out of luck, which presumably explains why we were told that tickets for both the Nikolas tower and the Armoury were ‘impossible’. The nice lady did, however, allow us to buy a general admission ticket. We queued up at the Kremlin entrance again, and on reaching the front, I was turned away because I was wearing a small backpack, much smaller than the hand bags being carried by the women who were being admitted in front of me. Perhaps I should have asked Bronwyn to carry it, but now I had to go back down to the gardens and check it in to a cloakroom. On my return, I was finally allowed in. The Kremlin (fortress) contains five cathedrals and a palace, along with numerous political buildings which appeared to be undergoing major reconstruction. Our ticket entitled us to visit each cathedral and palace, and also the surrounding gardens. At each doorway, and elderly lady solemnly signed our tickets so that we could not pass that way again. Inside, each cathedral was painted from floor to ceiling with saints in the usual Orthodox style. Each painting forms an icon, which church-goers pray to as an intermediary because they aren’t worthy to pray directly to their god. Instead of an altar, there are more icons, but these are individually painted on wood panels which are stacked in five or six rows up the wall. As individual icons get refurbished or gain popularity they are moved around between churches, and the upshot is that all the best and most powerful icons end up in the best and most powerful churches. Those churches are in the Kremlin, and many of their icons date back to the 14th century. This is all very interesting, but after five cathedrals full of them, we were quite tired of looking at icons. We did try to get into the Armoury even without a ticket, but were politely turned away, so after a snack and a drink in the rather lovely gardens, we headed back out into the big city. We needed to buy some supplies before boarding the Trans-Siberian Railway. 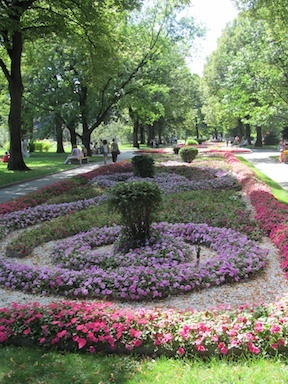 This entry was posted in Europe, Russia, Travel and tagged Moscow on 2012/08/09 by Reinhard.